Watch Shamir's Video for "Larry Clark"
Shamir, Philadelphia-based singer, songwriter and all-around inscrutable enigma, has released the video for his song “Larry Clark,” off his latest album, the surprise-released, previously Bandcamp-exclusive Resolution. The album marked Shamir’s continued exploration of guitar-based, indie rock-adjacent music, a sound he explored on 2017’s Revelations and its follow-up seven-inch Room, a far cry from the dance-indebted sounds of his previous work. 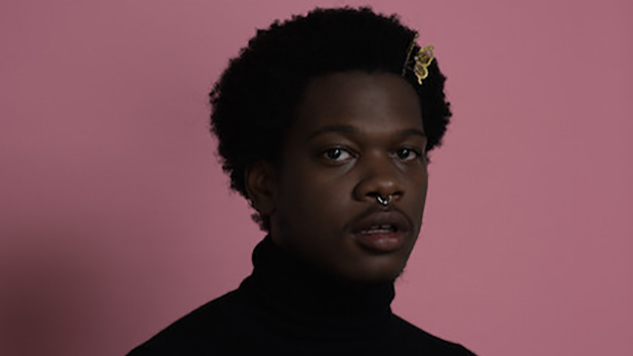 “Larry Clark” is a churning showcase of Shamir’s vocal range. The guitars sound nearly grunge-ish, or at least some offshoot thereof—Bush come to mind, for better or worse. But Shamir’s voice is so unique, so powerfully elastic, that the song resists the deep, dark pit of angst that plagued those forebears so. His voice is a light, a towering falsetto that shoots right into the heart. The video references folk-forebear Odetta’s 1959 performance of the song “Waterboy” on CBS. Shamir said in a statement that he made the video as an “homage to an old live video I watch to calm down and get inspired to for a big chunk of my life.” He stands similarly alone in a spotlight, singing to an unseen crowd just like she did. It has the weight and power of statement that Shamir excels at—the previous single from Resolution was titled “I Can’t Breathe,” and “Larry Clark” similarly hints at a lineage of oppression. Watch the video for “Larry Clark” below.